Nancy Yu also has a write up of stage two on her blog. Closely following Jason. Stage two Furnace Creek 508. 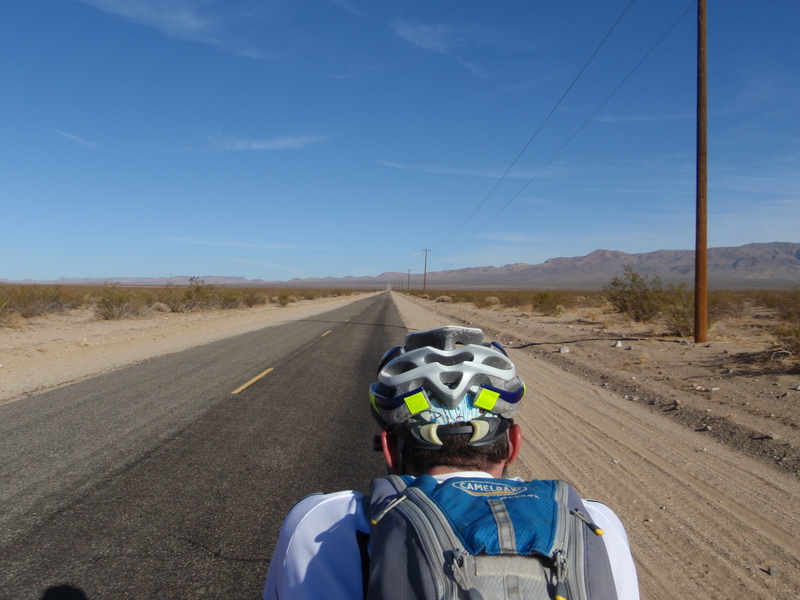 California City to Trona, city of bike paths. We had a tailwind the entire 72 miles on this stage. Actually we had a bit of a sidewind/downhill at first, but let’s just call it a tailwind. The stage was ridden faster than the riders. Riding with a tailwind is lovely. We had no business riding that stage that fast and we were pleased by our performance, even if we knew it was wind driven. I spend far more time riding into a headwind than I will ever spend riding with a tailwind, so I might as well bask in its glory. The problem with a tailwind in the desert is eventually you will climb and you will be hot. Tailwinds are hard on hot climbs. Neither Jason nor I are good in the heat. We both insisted on wearing camelbacks, even with a support vehicle, because we wanted iced water available at all times and camelbacks are very good at keeping water cool. Despite the camelback Jason and I faded fast on the gentle climb on our stage. Our heart rates plummeted when we hit the climb; we were just suffering from the effects of the heat. Jason’s heart rate hovered around 125. Eventually, Jason ran out of water, so we stopped to get more iced water in our camelbacks. Stopping was so lovely. We knew we had a tailwind, but we had no idea that the wind would be so pleasant. On the bike, the air was still, with the wind matching our speed, but when we stopped the breeze seemed cool and Jason and I felt better instantly. We were able to cool down quickly and then restart. We felt much better after our little break and were able to put out a more reasonable effort with higher heart rates. We had just overheated and the break made all the difference. We stopped in Randsburg to use the porta-johns. Luckily we arrived right before a bunch of confused and road-dazed tourists . They seemed to be having difficulty understanding that other people were using the port-johns, too, and, in general, seemed flummoxed by the whole porta-john system. A helpful man stood by and tried to explain the situation to them. Since the situation did not seem to warrant explaining, he was having difficulty figuring out exactly why they were confused and what exactly needed clarification. When we left they still seemed flummoxed, but we had places to go, so off we went to Trona. We were required to have a follow car from 6pm until 7am and, since we reached Trona in complete darkness, Jason and I did the last section of our stage with a follow car. I had been worried about riding with a follow car. I was worried that its presence would bother me. I feared I would be overly aware of having an audience and feel nervous. The car did not bother me at all. I might have been working a little harder, because I knew it was there, but it never made me anxious. At one point the car pulled up while we were starting a slight climb to ask if we needed anything. Jason was distracted by the car, so he backed off pedaling and he did not downshift. I think that Steve was the one asking us if we were ok and Jason was sort of answering and I forgot how to say the words “downshift” and became very annoyed. “Something is wrong,” I yelled and then I finally came out with the word downshift. Poor Steve thought I was angry with them, when I was mostly frustrated at myself for not being able to remember the word “downshift.” I felt bad for Steve. I just needed a lower gear and Jason was distracted and not shifting or pedaling as hard. 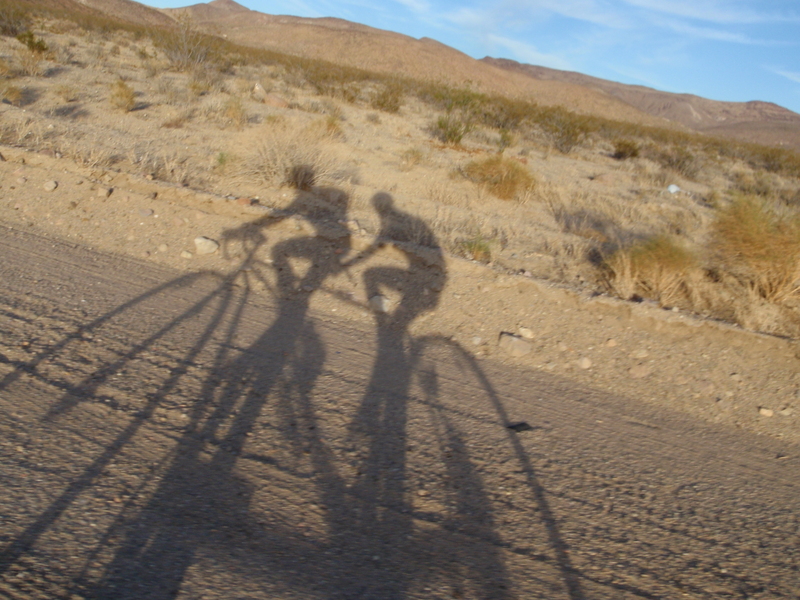 We arrived in Trona and Nancy and Tim were waiting on the side of the road astride his tandem, ready to leave. They were not able to leave until the follow car went with them, so they had to wait. Willy was in no hurry. He was hyped up and chatting and Jason was not exactly hyped up, but he seemed willing to talk. Tim and Nancy meanwhile, stood on the side of the road waiting. I eventually told Jason to stop talking back to Willy, so that he would get in the follow car and go. My legs straight up hurt after this stage. We had put out a good steady effort and the wind had been very inspirational. We had felt good and strong because of the wind and the downhill start and we felt even more inspired to throw down more effort on the road. We had a good ride and we were both pleased. Stage 2 profile. Stolen form AdventureCORP site. This entry was posted in Furnace Creek, Tandem and tagged 508, cycling, furnace creek, furnace creek 508, tandem. Bookmark the permalink.